A radically better way to visually communicate changes. It's super easy and fast for factories or team members to track the changes made on a Techpack. Let's say you've updated the specs on a style, now when you send or download a techpack PDF, those changes will be highlighted for easy noticeability. Imagine how much time it could save your factories flipping through those techpack pages trying to find the changes you've made. Step 2: Then click the print option button to view the drop-down menu. From the list, you'll have the option to generate that PDF with change comparisons. 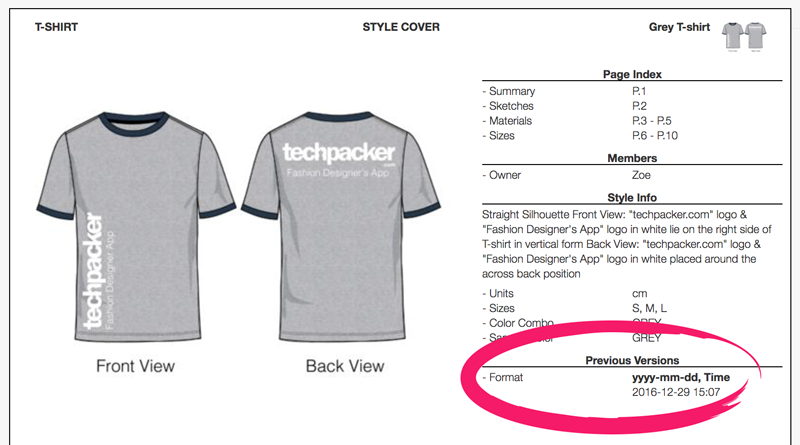 Previous records are also printed on the 1st page of new techpack PDF (see image below). These are great time-saving tools. All your techpacks and their versions are now well organized and you can access them anytime, anywhere!